Whether you’re planning to sail, ski or fish, we’ve got the state park that’s right for you. When Texas travelers plan a day at the park, water is often part of the picture. More than 40 state parks have boat ramps or launch areas that provide access to lazy bayous, rushing rivers, sparkling blue lakes, quiet coves, salt marshes and bays. Many have marinas that sell fuel and supplies. Some even rent boats to guests who can’t bring their own. If you’re itching to be afloat, here’s a sampling of what state parks have to offer. Skiers like long stretches of open water and not much wind chop. If it’s deep water, untroubled by subsurface humps or debris that might interfere with an expensive propeller, even better. Lake Whitney fits the bill. Built for flood control in 1951, this lake on the Brazos River has a long, winding shoreline that varies from gently sloping, wooded banks to rock points to tall limestone bluffs. On a windy day when the lake gets choppy, a skier can always find smooth water on the lee side of a bluff. The state park is on a point of the east shore, just where the lake starts to widen behind the dam. Manager Jeffrey Towers sees plenty of ski boats at the double-lane ramp, which is flanked by an ADA-accessible courtesy dock. There’s no boat gas in the park, but marinas elsewhere on the lake sell gas. This park is also popular with swimmers, scuba divers, jet skiers and anglers in search of striped bass. It’s an easy drive from Waco or Fort Worth, but according to one long-time visitor, Lake Whitney is usually less crowded than waters that are closer to the cities. With 23,000 acres of water to play in, people of differing interests can share the lake in peace. It’s not hard to see why sailboaters love Lake Texoma. Fans of the lake agree: It’s big, it’s deep, and the wind nearly always blows. Eisenhower State Park is situated at the lower end of the lake, less than a mile above Denison Dam and downstream of the point where Oklahoma’s Washita River meets the Red River coming in from the west. “No matter which way the wind blows, there’s some place you can go,” says Eisenhower Complex manager Paul Kisel. The double-lane ramp runs deep into a sheltered cove. “When the lake goes low, we don’t ever run out of ramp,” Kisel says, but a sailboat may need a kicker motor to push it into the main lake. Eisenhower Yacht Club, a full-service marina located in the park, has a floating store that sells picnic supplies, fishing bait and tackle, souvenirs and gas. The marina also rents boat slips, mostly to power boats, but there are two sailboat slips available for people who are camping in the park and don’t want to pull the boat out of the water. Those spots rent for $10 per night. For boaters who live in the arid regions of the state, Lake Colorado City can be an oasis. Like most West Texas impoundments, this 1,600-acre power-plant cooling lake is subject to changing water levels, but the four-lane boat ramp at the north end of Lake Colorado City State Park has never gone high and dry. The park is at the lower, wider end of the lake, six miles south of Interstate 20. Navigation is fine when the lake is full. When the level drops, there’s still room to ski, provided drivers avoid the shallow areas. Boat fuel is not available in the park, but can be purchased upstream at Cooper’s Cove or Lakeview Camp. The Texas Parks and Wildlife Department’s Web site describes Caddo Lake as “a sprawling maze of bayous and sloughs covering 26,810 acres of cypress swamp.” The state park is at the far west end on the main channel of Big Cypress Bayou. Moving on through the lake, the bayou retains the feel of a river lined with bald cypress trees, but there are shallow backwaters where “the trees go all the way across the water,” says park manager Todd Dickinson. Spatterdock, waterlily and American lotus spread their leaves on the surface and flower in spring and summer. The river channel averages 20 feet in depth, but most of the lake is five feet deep or less. Canoes can navigate the shallows, but bass boats tend to stick to the “boat roads,” indicated by numbered markers on the lake and on a map sold at the park’s canoe rental concession. 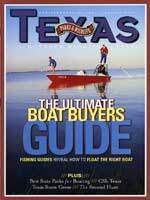 “The Texas side has about five main channels and 23 auxiliary channels that take you from one main channel to another. You can travel for days on this lake and not see the same place twice,” says concessionaire Dave Lomax. For first-time visitors, Dickinson adds that a Global Positioning System or GPS isn’t a bad idea. The park has two boat ramps, one at standard pitch and one slightly steeper, with a courtesy dock in between. Low water levels are seldom a problem at the boat launch, but heavy rains may put the approach and parking areas under water. Lake Casa Blanca, just east of Laredo, proved itself a serious bass lake last winter when 19-year-old Richard Mims caught two ShareLunker entries in one weekend. The first catch on Jan. 29 shattered the previous lake record for largemouth bass. Two days later, Mims broke his own record with a 14.64-pound lunker. The state park provides the only public access to this 1,650-acre lake. Fishing is good year round, with a small, mid-lake island providing extra shoreline habitat. To ensure good fishing into the future, this lake has a special 18-inch minimum length for largemouth bass. Tiny Goose Island, just over a mile long, lies in Aransas County at the confluence of St. Charles, Copano and Aransas bays. Park Road 13 connects two sections of the park, one on the island itself, the other on Lamar Peninsula. The two-lane boat ramp is at the mainland end of the bridge, providing easy access to all three bays. Shallow-draft flats boats are the ticket here; the channel isn’t deep enough to launch a boat with a keel. Guide services from Rockport make frequent use of the ramp. The area is also popular with fly anglers who navigate the bays in canoes and sea kayaks. People fish year round for spotted sea trout, drum and flounder. Red and black drum are especially good during the spring and fall migrations. Occasionally, a small shark will appear at the end of a line. For boaters who don’t know the area, good bay maps are essential for navigating around the shoals and oyster reefs. Maps are available at the park store and at area marinas and tackle shops. Goose Island is the oldest state park on the Gulf Coast, open since the 1930s. The original headquarters building, now a recreation hall, was built by the Civilian Conservation Corps. In addition to the boat ramp, the park has a 1,620-foot fishing pier at the east end of the island. “It’s one of the few places in Texas where you can walk out from a pier and collect oysters during oyster season,” says office manager Jan Cartwright. In Palo Pinto County, the Brazos River has cut a winding canyon through beds of shale and limestone that were laid 290 million years ago. The Brazos River Authority flooded part of that canyon in 1941 to create Possum Kingdom Lake. The two-lane boat ramp is well protected from the wind and has an ADA-approved courtesy dock. A privately operated marina in the park sells boat gas and other supplies. The marina also rents motorboats, pontoon boats, canoes and kayaks. It’s 14 river miles from the park to the dam. The lake extends another 40 to 50 miles upstream, so there’s plenty of exploring to be done. With the many loops and bends, keeping to the main channel can be tricky. Good navigational maps can be purchased at the park store and the marina. The Brazos River Authority (940) 779-2321) offers a free but less detailed map of the lake. This park on the Colorado River isn’t easy to get to, but those who negotiate the unpaved road to the park headquarters will find a peaceful stretch of river between high rock walls. The single-lane boat ramp is at the south end of the riverside campground. Nine miles downstream from the park, the canyon opens into the remote upper end of Lake Buchanan. Bald eagles nest in this area from November through March and may be spotted soaring overhead. When the lake is near conservation pool level, boaters can navigate all the way to the spot where Fall Creek plunges over a cliff to the lake’s surface. Along the way there’s a breathtaking view of Post Oak Falls, descending over 100 feet in a series of cascades. Its travertine formations offer a daylight glimpse of the forces that are still at work in the caves of Colorado Bend. There’s no gas in the park or anywhere in the immediate area: fuel up before leaving San Saba, Lampasas or Cherokee. Because Texas weather is unpredictable, water levels and ease of boating access can change quickly. Also, some parks will be closed for public hunts on certain weekdays in December and January. For more information on boating and water-related activities in state parks, visit www.tpwd.state.tx.us/park or pick up a copy of the Texas State Park Guide. From U.S. Highway 75 north of Dallas; take Exit 72 to State Highway 91 North to Denison Dam, and on to FM 1310 West; travel 1.8 miles to Park Road 20 entrance. 3 miles west of Whitney on FM 1244. From Interstate 35, take the Hillsboro exit. In Hillsboro take State Highway 22 west to Whitney, then follow the signs to state park. 11 miles southwest of Colorado City off Interstate 20 on FM 2836. From Marshall, take State Highway 43 north, go 1 mile past Karnack to FM 2198. Turn east and go 1/2 mile to Park Road 2. From U.S. Highway 59 east of Laredo, take Bob Bullock Blvd. (Loop 20) and turn on State Senator Judith Zaffirini Road. Take State Highway 35 to Park Road 13, then 2 miles east to park entrance. West of Mineral Wells in Palo Pinto County. Take US Highway 180 to Caddo, go 17 miles north on Park Road 33. West of Lampasas, southeast of San Saba. From the intersection of US highways 281 and 183 in Lampasas, take FM 580 west 24 miles to Bend. From San Saba, take US 190 about 4 miles to FM 580 and follow the signs 13 miles to Bend. Follow signs 4 miles to park entrance. The headquarters, main camping area and boat ramp are 6 miles past the entrance on the dirt road (unmarked County Road 442). The Texas State Parks Pass lets you visit all Texas parks for a full year, and the TPWD Family Fishing Celebration means your entire family can fish in the state park without purchasing a license. The parks pass and the opportunity for free fishing make your outdoor adventure into a great value.